How much of your week is taken up by meetings? Not just by the meeting itself, but the travelling, the waiting around for latecomers and so on. It’s probably more than you’d like, particularly if the meeting fails to live up to expectations. This is often made worse by non-attendees, who haven’t been able to make the appointment because of other commitments or are simply too far away to make it worth their while travelling. Effective collaboration and close working has always been an issue between colleagues who are geographically far apart. Businesses waste huge amounts of time and money on ineffective meetings, especially those where key people are late or fail to show. One significant finding for the UK in a recent global study by IT, telecoms and media analyst Ovum found that senior executives waste roughly 139 hours each year waiting for late meetings to start. That’s a staggering three working weeks when you or a colleague are just sitting around and getting frustrated, when that time could be put to more productive use. Perhaps more worryingly, the Ovum study estimates that the average cost of late meetings to a medium-sized enterprise is an eye-watering $5.3 million. The issue is that scheduled meetings are unlikely to suit all of the people all of the time. To get around the difficulties of having to arrange meetings in advance, employees are increasingly turning to more agile, ad-hoc meetings. This increasing demand for ad hoc meetings is being driven by the rise of Generation Y, ‘the Millennials’, in the workplace. Those born after the 1970s typically want it all and want it now. Waiting around for a meeting that is unlikely to provide what they expect must be avoided at all costs. Instead they prefer on-the-spot collaboration as a means to save time and money, and be more efficient. These types of impromptu get-togethers are ideal for a workforce that is increasingly mobile, being in a different place from one day to the next. They are also key drivers for business, as improved collaboration leads to the sharing of ideas and work practices. It’s no wonder that around a quarter of all external one-on-one meetings are ad hoc; a figure that is only going to increase. Combine this with the time savings of meeting when it’s immediately convenient and when everyone is available, and this equates to improved workforce efficiency – a no-brainer for every business in today’s highly-competitive market. Another trait of Generation Y is that they are hyper-connected and very confident using technology. But that isn’t to say that Generation X doesn’t recognise the advantages of connected technology. Ovum’s research shows that a large proportion of workers of all ages now take personal connected devices into face-to-face meetings. In the UK, roughly the same percentage of workers are taking laptops and/or smartphones into meetings (30% and 31% respectively). Yet on the continent, the use of laptops is greatly preferred to smartphones in meetings, particularly in Germany where 40% of employees take a laptop, while only 17% a smartphone. The use of tablets for meetings across Germany, France and the UK is roughly the same at between 11% and 14%. As workers across Europe are using second-screen mobile devices in meetings, many are now asking themselves: “Why do we even need to physically meet?” They are turning to virtual meeting tools. But for such interactions to truly work effectively, these meeting tools must be instantaneous and instinctive to use. The advent of superfast fibre optic and cable broadband, along with the proliferation of 4G (and 5G just around the corner), has enabled remote or mobile workers to communicate like never before. Increased bandwidth across all platforms means it’s now possible to combine several forms of communication – video, audio, messaging, file sharing – into one application and run them simultaneously. More importantly, for a workforce that’s increasingly on the move, these can be used effectively on mobile devices. By using these scalable and secure next generation web conferencing tools - from a laptop, tablet or smartphone - a user can instantly interact in a virtual meeting with up to 250 participants, and share documents, presentations, and messages. Being able to meet using intuitive collaboration solutions is a game changer for business, offering several key advantages over meeting in person. The most obvious is that if you can get everything you’d normally expect out of a meeting without having to physically be there, then you can make huge time and money savings. Vastly reduced travel costs, no more waiting around for an event to start and negating the need to book or hire a venue. There’s also no longer the constraint of having to arrange meetings far in advance to ensure everyone required can attend. If you know you can instantly take part in a fully interactive meeting from your desk, home or while on the move, it makes it much easier to attend. Employees looking to gain the benefits of more agile virtual meetings and avoid the headache of using traditional web conferencing tools are increasingly turning to their own devices and applications. The consumerisation of IT sees staff circumventing legacy systems to help do their job more effectively and fit in better with their lifestyle. This is a situation recognised by many companies. 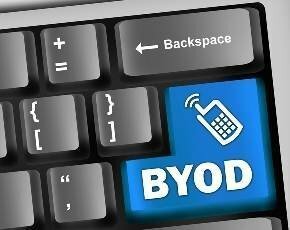 BYOD is now an accepted culture within many organisations. For example, Ovum reports that 80% of workers take their own devices into meetings. BYOD has moved on. The convergence of consumerisation and the rise of the cloud has led to the emergence of BYOA (Bring-Your-Own-Apps). As employees bring their own devices to the workplace to get around legacy systems, it’s become apparent that the Unified Communication and Collaboration (UCC) tools they need to use for virtual meetings can be hindering their efficiency. Indeed, BYOA is already spreading like wildfire throughout business. A survey for LogMeIn by Edge Strategies found that around 60% of companies questioned in the UK and Ireland reported that employee-introduced apps were being used in the workplace. Further research discovered that similar organisations each had around 21 BYOAs. These could be quite concerning figures for any IT department. They represent a loss of control but more seriously could bring security and compatibility issues. One way companies are getting around this is to assimilate these apps into their own software portfolio. The LogMeIn BYOA report goes on to show that more than two-thirds of all cloud sync and share apps, productivity apps, and collaboration apps were first introduced by employees. With such a wide range of choices of what they can now use in the workplace, employees are going to make a beeline towards those technologies that work best for them and make their lives easier. These will be mobile devices and apps that allow them to instantaneously and effectively collaborate with others from wherever they happen to be. This can only be a positive step for any business looking to improve the efficiency of their staff and reduce the escalating costs of holding and attending meetings. As more employees work from remote locations regularly, companies need solutions that are going make their staff more agile and better connected. This improves communications, productivity and ultimately makes for better business decisions.